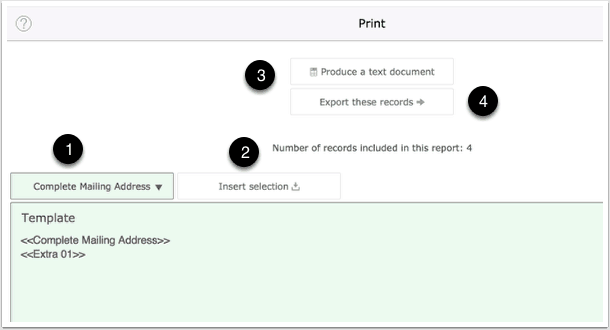 Printing of client details is managed from the People Component. If you want to print labels then find the people records and export the result which you can then open in a dedicated label program or in a programme such as MS Word that features label printing features. First find the people records you want to print. Select Print. Or use keyboard shortcut Cmd-P which is found under the File menu on Desktop devices. This screen allows you to control the details to be printed. Make selections from this menu from a range of fields including Complete Mailing Address which returns the person’s name and postal address. Use the Insert button to insert your selection into the template. You can add your own text where required and on desktop devices use the formatting menu to control the typeface design. Use this button to produce a text document that you can edit and copy for use elsewhere. Use this button to export the result to a text file. (Exporting records will not maintain any text-formatting you may have applied).